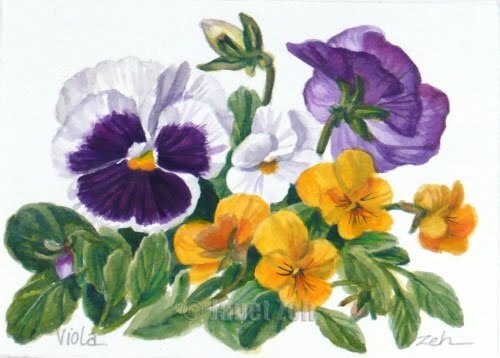 The other day, I stopped at the hardware store and saw they now have pansies for sale. I love this time of year when the weather is still cool because this is what pansies like! So I just had to get some and plant them in a big pot in my garden. And I just had to paint them too. As botanical illustrations are done from the live plant under controlled lighting, I brought the pot inside to do this detailed botanical painting. This 5"x7" painting is done with watercolor and a touch of colored pencil for depth of color and detail. You can see my flower paintings in my shop on Etsy. Thanks for visiting my blog today.